A common rock-forming mineral and the primary constituent of a sedimentary rock known as "dolostone"
Dolomite crystals: Dolomite crystals from Penfield, New York. This specimen is approximately 3 inches (6.7 centimeters) across. 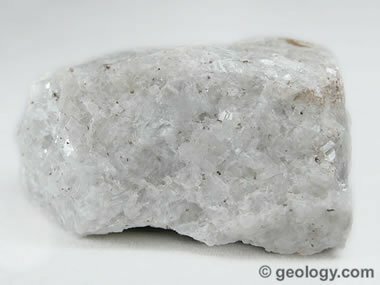 "Dolomite" is a word that is used by geologists in two different ways: 1) as the name of the mineral dolomite; and, 2) as the name of a rock known as dolomite, dolostone, or dolomite rock. This page is about the mineral dolomite. If you are looking for an article about the rock, please go here. Granular Dolomite: Dolomitic marble from Thornwood, New York. This specimen is approximately 3 inches (6.7 centimeters) across. 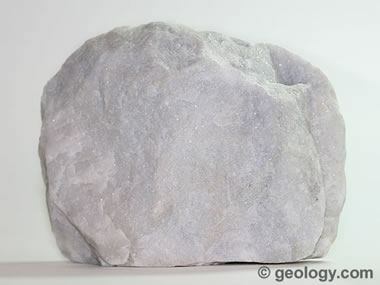 Dolomite is a common rock-forming mineral. It is a calcium magnesium carbonate with a chemical composition of CaMg(CO3)2. It is the primary component of the sedimentary rock known as dolostone and the metamorphic rock known as dolomitic marble. Limestone that contains some dolomite is known as dolomitic limestone. Dolomite is rarely found in modern sedimentary environments, but dolostones are very common in the rock record. They can be geographically extensive and hundreds to thousands of feet thick. Most rocks that are rich in dolomite were originally deposited as calcium carbonate muds that were postdepositionally altered by magnesium-rich pore water to form dolomite. Dolomite is also a common mineral in hydrothermal veins. There it is often associated with barite, fluorite, pyrite, chalcopyrite, galena, or sphalerite. In these veins it often occurs as rhombohedral crystals which sometimes have curved faces. Dolostone: Dolostone from Lee, Massachusetts. 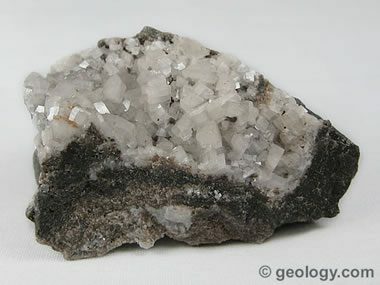 The "sugary" sparkle displayed by this rock is caused by light reflecting from tiny dolomite cleavage faces. This specimen is approximately 4 inches (10 centimeters) across. 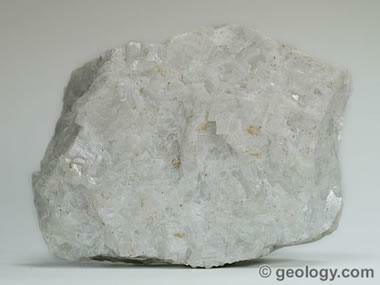 Dolomite is very similar to the mineral calcite. Calcite is composed of calcium carbonate (CaCO3), while dolomite is a calcium magnesium carbonate (CaMg(CO3)2). These two minerals are one of the most common pairs to present a mineral identification challenge in the field or classroom. 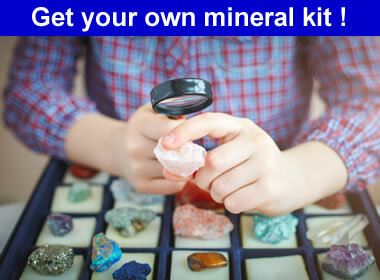 The best way to tell these minerals apart is to consider their hardness and acid reaction. Calcite has a hardness of 3, while dolomite is slightly harder at 3 1/2 to 4. Calcite is also strongly reactive with cold hydrochloric acid, while dolomite will effervesce weakly with cold hydrochloric acid. 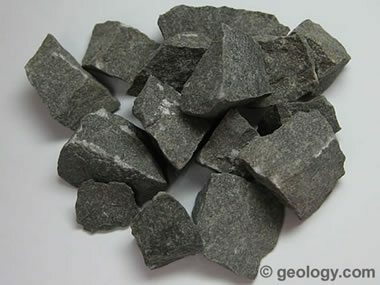 Dolomite aggregate: Dolostone, used for asphalt paving from Penfield, New York. These specimens are approximately 1/2 inch to 1 inch (1.3 centimeters to 2.5 centimeters) across. Dolomite occurs in a solid solution series with ankerite (CaFe(CO3)2). When small amounts of iron are present, the dolomite has a yellowish to brownish color. Dolomite and ankerite are isostructural. Kutnahorite (CaMn(CO3)2) also occurs in solid solution with dolomite. When small amounts of manganese are present, the dolomite will be colored in shades of pink. Kutnahorite and dolomite are isostructural. Dolomitic marble from Thornwood, New York. This specimen is approximately 4 inches (10 centimeters) across. Dolomite as a mineral has very few uses. However, dolostone has an enormous number of uses because it occurs in deposits that are large enough to mine. The most common use for dolostone is in the construction industry. It is crushed and sized for use as a road base material, an aggregate in concrete and asphalt, railroad ballast, rip-rap, or fill. It is also calcined in the production of cement and cut into blocks of specific size known as "dimension stone." Dolomite's reaction with acid also makes it useful. It is used for acid neutralization in the chemical industry, in stream restoration projects, and as a soil conditioner. Dolomite serves as the host rock for many lead, zinc, and copper deposits. These deposits form when hot, acidic hydrothermal solutions move upward from depth through a fracture system that encounters a dolomitic rock unit. These solutions react with the dolomite, which causes a drop in pH that triggers the precipitation of metals from solution. Dolomite also serves as an oil and gas reservoir rock. During the conversion of calcite to dolomite, a volume reduction occurs. This can produce pore spaces in the rock that can be filled with oil or natural gas that migrate in as they are released from other rock units. This makes the dolomite a reservoir rock and a target of oil and gas drilling.